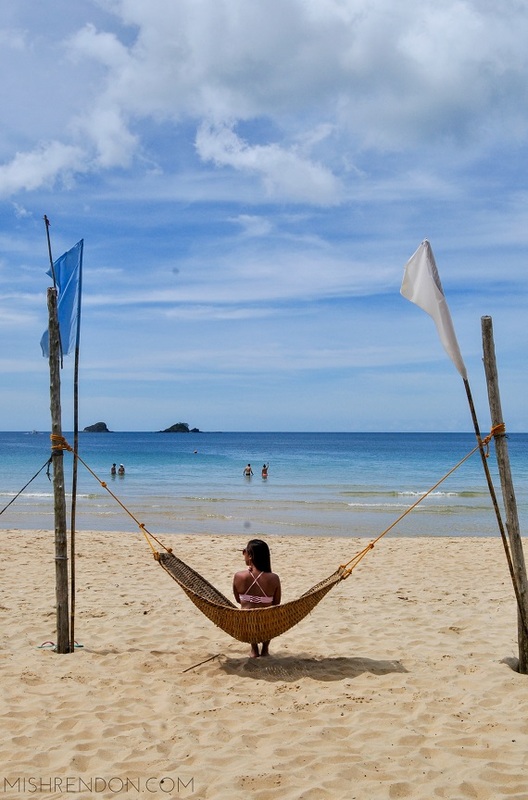 Island tours in El Nido can be quite exhausting as they try to cover at least five destinations in one day. 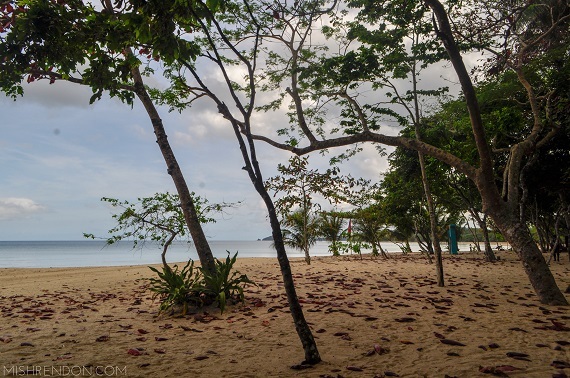 If you opt for a chill and relaxing day, a visit to Nacpan Beach is your best choice. 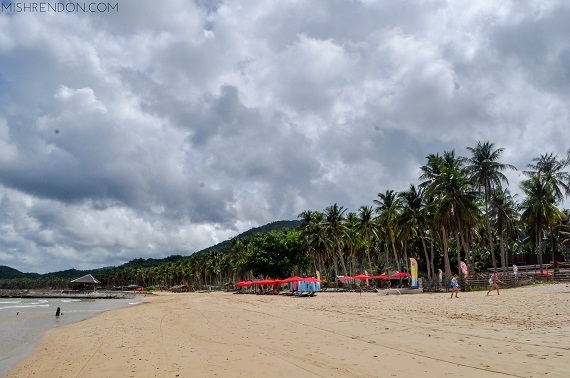 Just a 40 minute ride from the town proper, Nacpan Beach has become one of the popular inland destinations in El Nido and that's all because of the long stretch of white sand and clear waters that it offers. 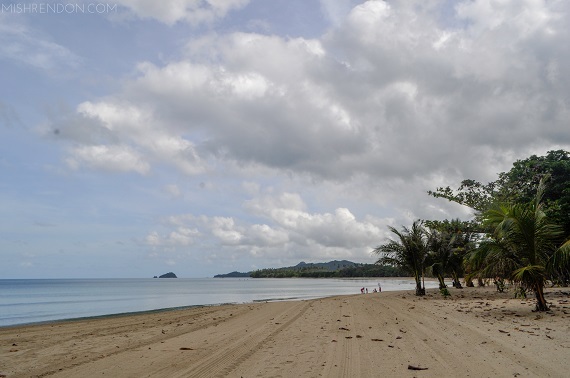 As part of our itinerary with Northern Hope Tours, we get to visit Nacpan Beach on our last day. 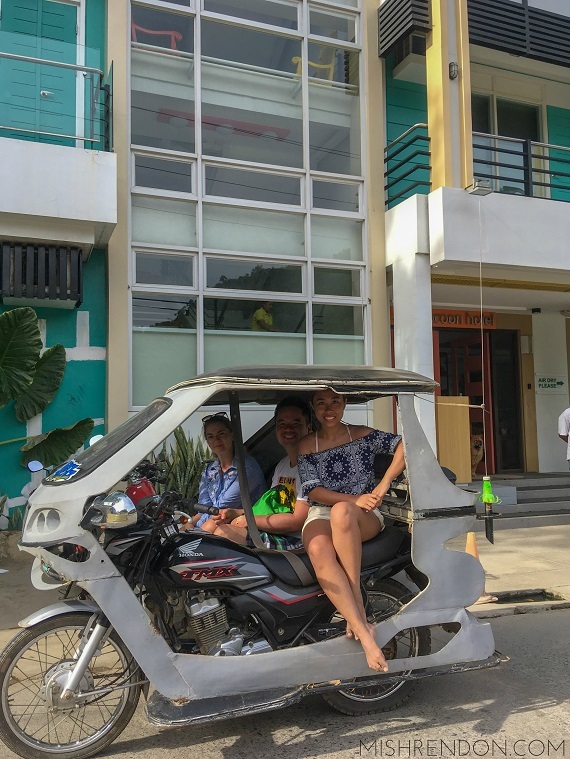 Since there were just three of us, we were provided with a tricycle to ride. 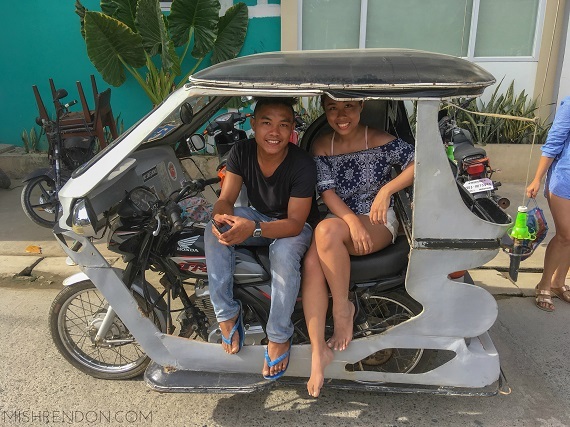 I love tricycles in Palawan. They have so much character and they're much more spacious than the ones here in Manila. Since I was the only person who could fit in the back seat (my blogger friends both being tall), I got to seat at the back and enjoy the scenery from there. 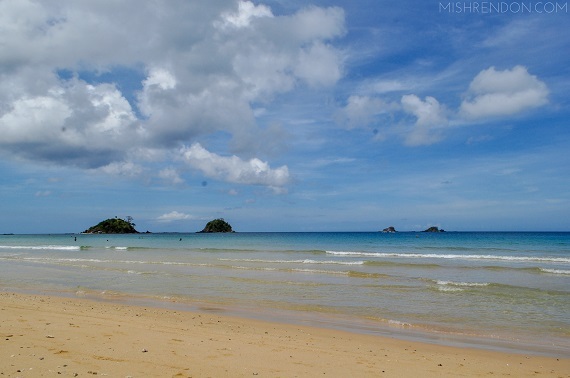 We got picked up at 9 in the morning by Deo for our Nacpan Beach trip. 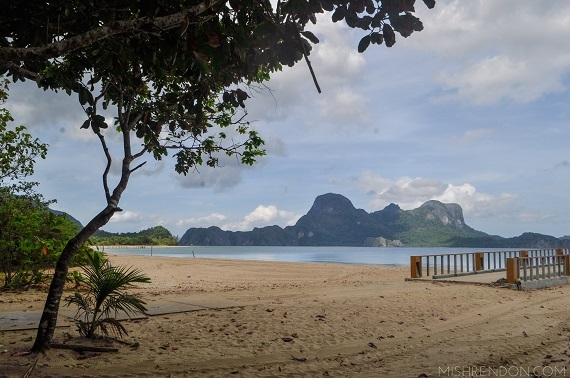 While I prefer DIY-ing my tours on a normal basis, this particular trip in El Nido made me thankful that we got a local to tour us around. First, they know the roads really well. There were parts of the trip to Nacpan Beach which were still rough roads and he was able to maneuver through those smoothly. We also get to shorten our time going there being familiar with the same. Also, they get to suggest other activities to do. He suggested hiking up Taraw Peak and visiting Nagkalit-kalit Falls. 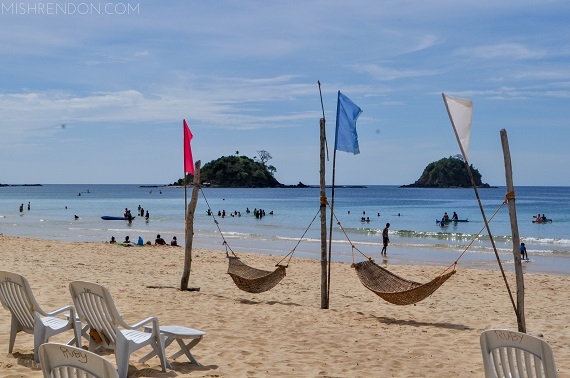 I guess those are nice activities for when I come back to El Nido. 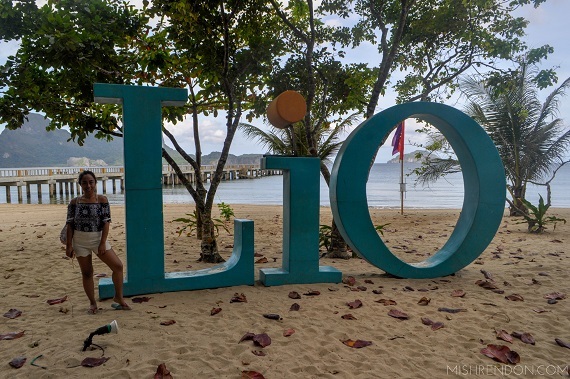 Before heading to Nacpan Beach, we asked Deo if we could stop by Lio Beach to satisfy our curious minds. He gladly took us there before heading to Nacpan. We stayed there for just a few minutes to see what's around. There were a few establishments in the area that were still closed because it was too early but I wasn't impressed entirely with the beach. When we got there it was quite cloudy and I was worried that it might stay that way the entire day. We just took some photos and left for Nacpan. 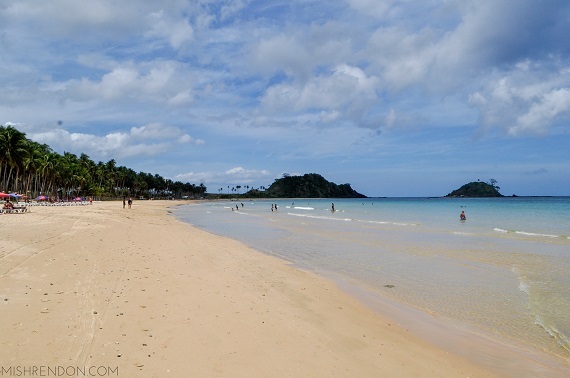 After our little detour, we headed finally to Nacpan Beach. 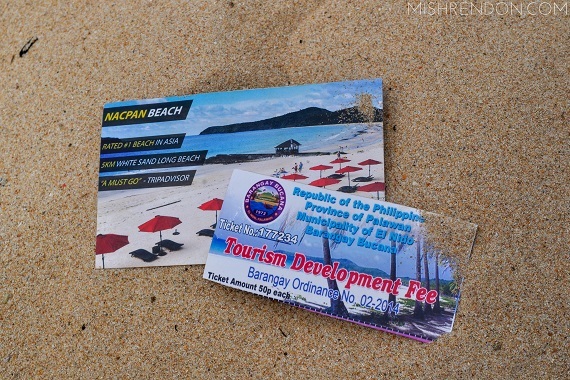 When we got there, we were asked to pay P50 for Tourism Developement Fee. I believe this is used in keeping the place well-maintained. 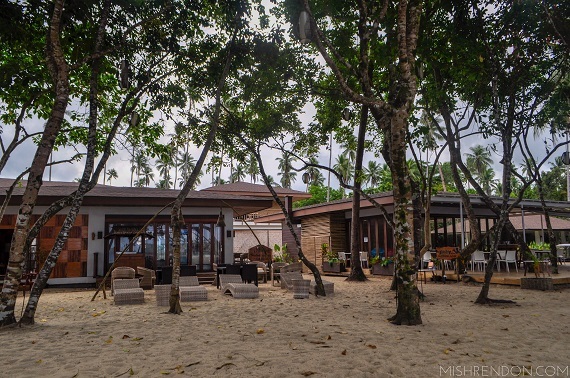 After Deo parked the trike in the designated parking areas, he told us that we could stay anywhere but the cottages and chairs are usually for rent. We decided to stay nearby and it was a good thing that I brought my Lagu with me. 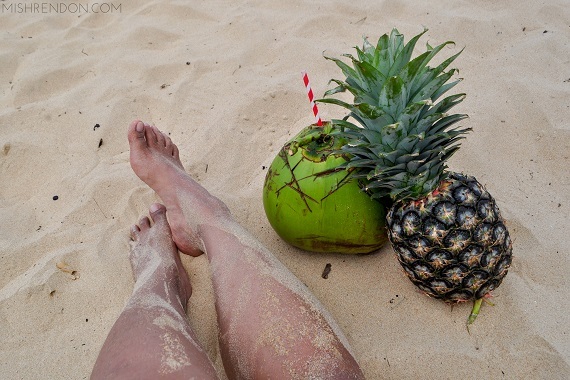 Who goes on a beach trip without buko juice? And how beautiful is this sand? 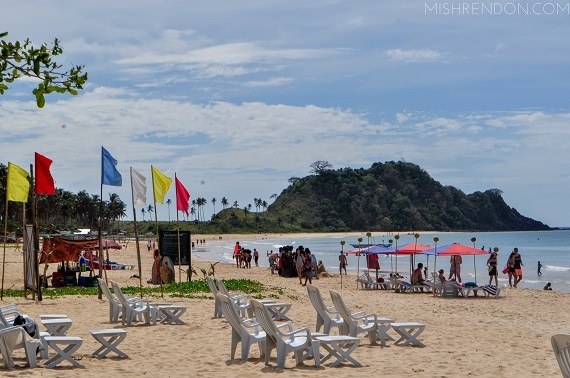 For a relaxing place such as Nacpan Beach, I suggest you just chill and enjoy the sun, sand, and sea. 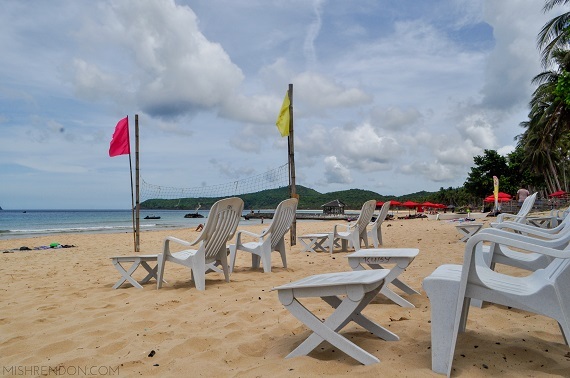 The place boasts of pristine waters and fine white sand that goes on for kilometers. I love how it does not get too crowded as the day progresses. It's a huge beach, anyway. The water descends gradually which made me felt like it was kind of shallow when I got in. The current is also not strong which makes it perfect for when travelling with kids. I personally prefer swimming in such waters. 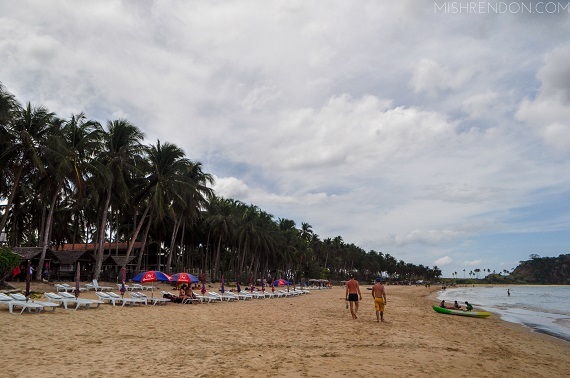 Otherwise, you could lie down and get a tan or take tons of photos (which my blogger friend and I did). I wish though we got there at an earlier time because the sand gets too hot in the afternoon (eventually the sun decided to show up, which is kind of weird because I actually thought it would be cloudy the entire day). Unlike our other tours, we weren't provided with lunch. I didn't find this a trouble because there are tons of restaurants, stores, and even bars by the beach where you could get food and drinks. Food is kind of pricey but the restaurant we ate in actually had good food. One of my companions actually got some drinks from a store near the place where we were initially staying and they later on allowed us to use their chairs and tables for the rest of the day. I suggest you doing the same instead of renting chairs and tables. If I am not mistaken, it could cost up to P150 for the rental of those for the day. 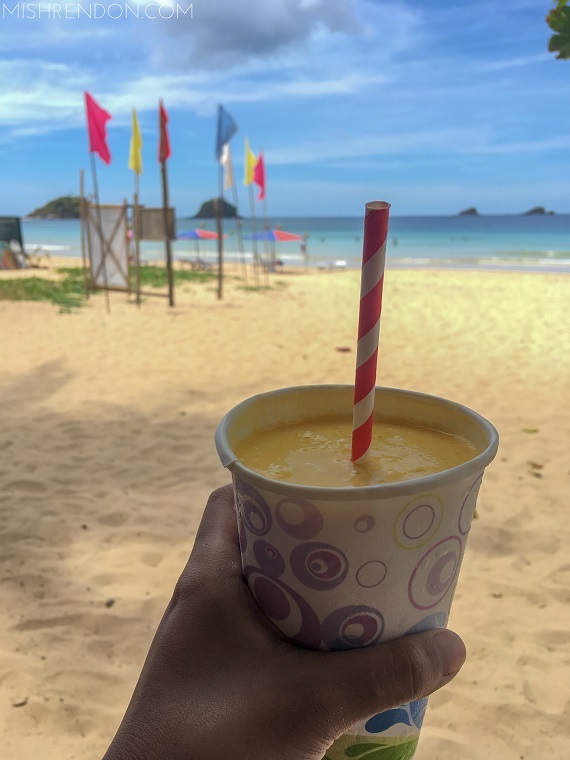 P100 Mango Shake. It was worth every peso. Also, I love how no one uses plastic straw and cups in this place. 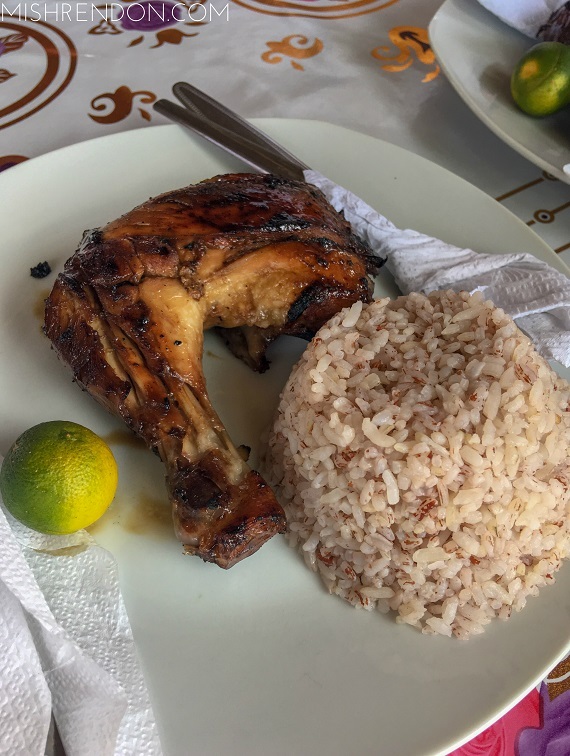 Chicken Barbeque for P150. 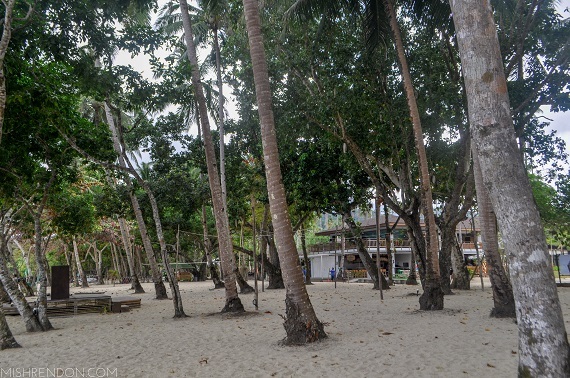 It was the best meal I had in El Nido until we got to visit Cafe Athena later that day. 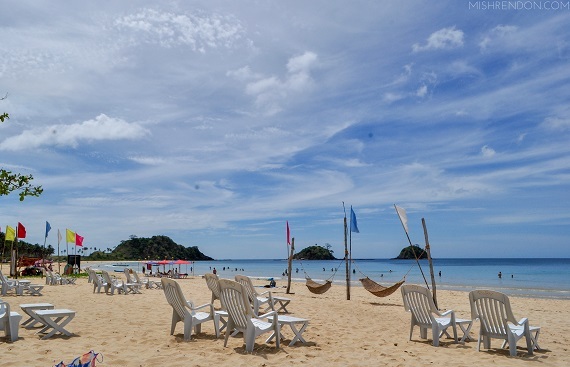 Our trip to Nacpan Beach was definitely made convenient by having a booked land tour with Northern Hope Tours. We got picked up straight from our hotel and back. It also gave me a peace of mind knowing that there was a driver waiting for us the entire day, just in case we decided to leave at an earlier or a later time. We stayed at Nacpan for at least six hours, that is, right after my flipflops gave up on me. We didn't actually do much but to just enjoy the water, sand, and scenery. Before heading back to the hotel, Deo actually offered to take us to Las Cabanas to see the sunset, but we had plans for the rest of the afternoon already. Round trip tricycle rental costs P1500 for the entire day. This covers up to 3 persons already. If you are traveling with a bigger group, you may opt for a round trip van rental for only P3000 for the entire day. This option could cover up to 12 individuals.